I love finger food recipes for entertaining. I also love goat cheese recipes. This wonderful gourmet appetizer recipe fills the bill on both counts. 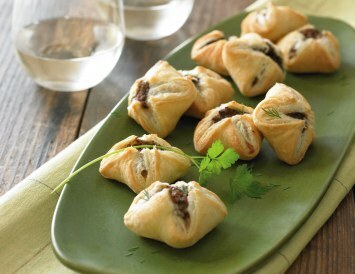 Light puff pastry pockets filled with a luscious mixture of mushrooms, goat cheese and fresh herbs. Remove the pastry sheets from the package and let thaw at room temperature for 30 minutes. To make the mushroom filling, chop the mushrooms finely and set aside. In a large skillet over medium-high heat, warm the olive oil and swirl to coat the pan. Add the shallots and sauté for about 2 minutes until just beginning to soften. Add the mushrooms and sauté, stirring frequently, for about 3 minutes until they just begin to soften. Add the salt and a few grinds of pepper and continue to sauté for about 5 minutes longer until the mushrooms give off their juices. Add the parsley, dill, thyme, and goat cheese to the pan. Sauté, stirring constantly, for 2 to 3 minutes longer until most of the liquid has evaporated and the goat cheese is blended in. Remove from the heat. Set aside and let cool. Position one rack in the center and a second rack in the lower third of the oven and preheat to 425°F. Have ready 2 rimmed baking sheets, preferably nonstick. For pans without a nonstick finish, line the pans with parchment paper or use Silpat mats. Unfold 1 of the pastry sheets and place it on a lightly floured cutting board. If there are any cracks in the pastry, gently pinch them closed. Using a lightly floured rolling pin, roll over the pastry gently, just enough to remove the fold marks, and then roll it out into a 10-by-15-inch rectangle. Using a sharp knife or pizza wheel, cut the pastry sheet lengthwise into four 2 1/2-by-15-inch strips. Cut each strip crosswise into 6 equal pieces to form a total of twenty-four 2 1/2-inch squares. Repeat with the second sheet of pastry. Brush each square with the egg wash on the side facing up. Put a rounded teaspoon of filling in the center of each square. Gather the four corners and bring them up to the center, pinching the dough together firmly to secure it at the point, forming square pouches. Leave the seams along the edges open so some of the mushroom filling shows. Transfer the mushroom pockets to the baking sheets, placing them about 1 inch apart. Lightly dab the sides of the pockets with any remaining egg wash.
Bake for 10 minutes, switch the position of the baking sheets, and continue to bake for about 4 to 6 minutes longer until the pockets are puffed, golden brown on the sides and bottom, and crisp. Transfer to a wire rack and let cool slightly. Serve these delicious goat cheese and mushroom appetizers warm or at room temperature. This wonderful little appetizer recipe is not only delicious, it is fairly healthy for us. Mushrooms, especially when you use a selection of mushrooms as you do in this recipe, are very healthy for us. We tend to think of the mushroom as not containing much nutritional value, but the truth is that those little gems are very good for us. It’s always good to find another way to incorporate them into our healthy eating plans. Each of the fresh herbs in this recipe also add health giving properties to the recipe. Can you just imagine the smells coming out of your kitchen as you bake these? This is finger food recipes at their best! It is a stunningly beautiful book, full of gorgeously photographed images of the book’s finger food recipes, main course recipes and side dishes. You can find our full review of Diane’s cookbook here. I think it is a must have staple, not just for the holidays, but with great any time recipes you will treasure for years. You will find many more finger food recipes in our appetizer recipes section. Browse here.